‘Caravan’, from Joe O’Donnell’s celebrated 1976 album ‘Gaodhal’s Vision’, features in a stunning new Irish music compilation! 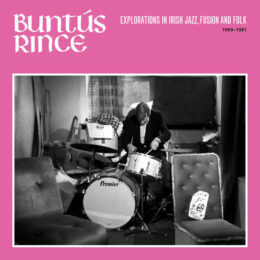 ‘Buntús Rince, Explorations in Irish Jazz, Fusion and Folk 1969-81’, is the latest project from re-issue specialists Allchival (All City Music). This puts Joe in distinguished company, ranging from Rory Gallagher’s Taste, and Granny’s Intentions (with whom Joe also played), to psychedelic eccentrics Dr. Strangely Strange and major jazz guitarist Louis Stewart. The compilation is by RTE’s Peter Curtin and others. It documents the explosion of creativity in Ireland while it was still relatively isolated from the international music scene. The album comes out on 13th April (Record Store Day) as a vinyl double LP. It is also available for download / streaming. See pre-release offers on Bandcamp and read Mike McGrath-Bryan’s review on Nialler. Or why not drop by All City Records in Temple Bar, Dublin on 13th April and take a copy home?